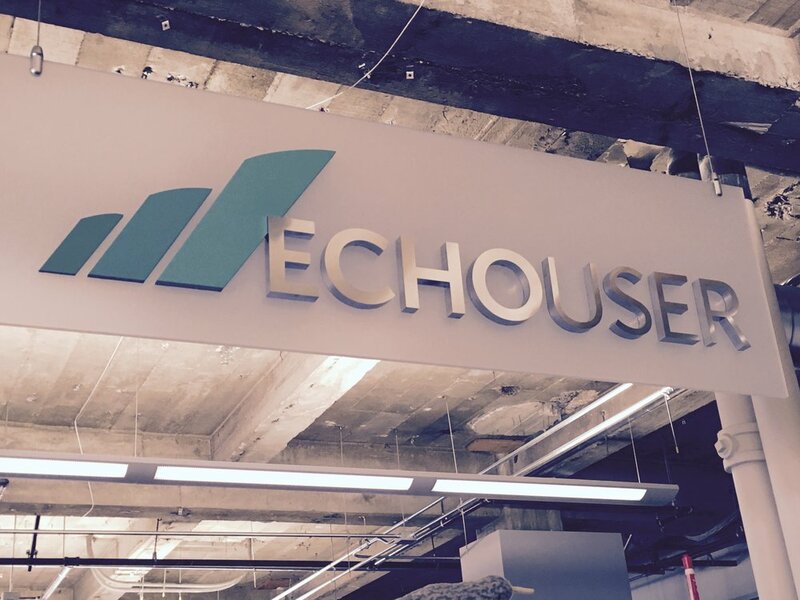 One of our first visits was a user research and design startup called EchoUser — a company my good friend and mentor, Mick McGee, started a decade ago with cofounders Aaron and Manik. Located in the heart of the financial district with its very own quintessential Blue Bottle Coffee downstairs, EchoUser also has offices in Washington, D.C., and Boulder, CO. Always experimenting with creative ideas such as renting out its San Francisco office space to tiny startups, EchoUser also applies this non-standard and innovative approach to its choice of projects, ranging from quantifying the pregnancy process to understanding the user experience of Pokemon Go. With creative methodologies, comes a diverse workforce with a wide array of research and design skills. After receiving a warm welcome by an all-female team, we were shown around the office and given a masterful tour, which included an explanation of the colorful, post-it-covered walls and erasable walls. Every inch of wall space could and would be used to stimulate the creative mind. In that moment, we all wished that we had those walls in our homes, our universities, and our companies! While munching on donuts and sipping coffee, we learned about the design process and walked through a user experience project at a local San Francisco restaurant. Through this example, we understood how and why specific components of the design process were implemented for an actual client. And some of these methodologies and ways of thinking are definitely something many of us will apply in Japan for our research and for our future companies. Last but not least, with such a fantastic team, comes an appealing list of clients such as Google, Juniper Networks, Oracle, Cisco, NetApp and Salesforce. EchoUser is definitely one cool company. Founder Tracy Lawrence, and I met a few years ago at a female entrepreneur, networking event — an event I was asked to attend on her behalf by my female CEO. After directly asking if she was also a hapa, or a person of mixed-race descent, we immediately clicked and became fast friends. Since then, she has taught me how to surf, what it means to lead a company of 20+ employees, and even how to properly indoor rock climb! From the start of our friendship, I have always been impressed by the mere facts that she and I are the same age, and she started Chewse with cofounder Jeff Schenck, while still in college at the University of Southern California (USC). Now, her company is located in the heart of the SOMA district with a vibrant and lively office environment. Chewse is a food catering startup that partners with high-quality restaurants to deliver highly customized meals in San Francisco. What sets Chewse apart from all its competitors, is its approach to customers. Every part of the process is personalized for the customer and built with love for the clients’ teams. Not only is the logo a heart, but the founders live and breathe this very way of thinking. One of the first things we noticed was her inviting persona, her kindhearted smile, and her hospitable office atmosphere. As we were all seated by the exit / entrance door, we noticed how Tracy greeted every person by name. Plus, she took the time to answer a multitude of questions from our captivated audience. When we specifically asked her, whether she would choose employee happiness and wellbeing over sales and profits, she immediately responded with respecting and improving company culture. If a company truly values its employees, sales and profits will follow. After all, an unhappy workforce leads to an abysmal and unproductive working environment. To enhance its company culture, not only does Chewse hire people who are honest, curious, and authentic, but it also hosts regular Happy Hours and dinners. And with its fun working environment, comes a team who respect and care about each other’s lives outside the company. Through our interaction with founder, Tracy Lawrence, we learned valuable lessons that expanded our horizons, and will enhance our future companies. Jokingly, I informed a few students and the professor that I was treating them to a very expensive Google lunch. Since Professor Suematsu knew the truth, he was chuckling to himself. But the others were impressed and curious about how much I was paying. After waiting a few awkward moments, I told everyone the truth — lunch is always free at Google! In fact, breakfast, lunch, and dinner for Google employees is free, among millions of other benefits. As an ex-Googler of 2+ years, I’ve experienced much of what Google has to offer, and appreciate it all, even to this day. Even now, I still have many friends who work at Google. We met with one of my friends, Charles Lai ­— Platform Management Specialist (Google Play & Gmail) — who invited Garrett Lay — Product Support Manager (Hardware). Both were incredibly warm people, who were very generous with their time, each spending over 1.5 hours with us. With Charles, we received a grand tour of the main campus, the Google Store, and the Google Museum — basically, a place to showcase the famous celebrities who have visited the Google campus such as the Dalai Lama and Barack Obama. With Garrett, we asked him very targeted questions about life as an Engineering Product Manager at Google. Since our first Google visit was exceptional, we decided to go back the very next day to meet with Jason Chan — Global Lead of Travel Ads at Google. Extremely generous with his time, Jason spent over two hours with us, discussing life in Silicon Valley, and his point of view about how the company is organized. Google is famous for its inherent trust and respect of its employees, allowing for more personal freedom than, I dare say, the majority of Japanese companies. And since Jason has spent over a dozen years at the company, he has a unique perspective on how individual freedom has historically been structured for a 500+ person company, and now an 80,000+ person company. We picked his brains to gain some of his expertise, while sipping on delicious green smoothies we ordered with the barista. Before we left, we even had the opportunity to order customized deli sandwiches, which we scarfed down for lunch. Plus, mine was gluten-free and smothered in vegetables! Overall, our interactions at Google were priceless. Not only were my MBA colleagues thrilled, but also my professor said that he gained invaluable knowledge to bring back to Japan. And for me, it was a welcome walk down memory lane. Although we visited both my professor’s Alma Matter (Stanford) and mine (UC Berkeley), our visit to USF’s Entrepreneurship Center was exceptional. The minute we arrived, Professor Mark Cannice, Department Chair and Professor of Entrepreneurship and Innovation at University of San Francisco School of Management, greeted us and proceeded to give us a grand tour of the stunning university. Afterwards, we all gathered around a healthy sampling of fresh fruit, yogurt, granola, bagels, croissants, muffins, and drinks. Towards the end of our visit, we gave a brief, special guest lecture to an undergraduate Japanese History class. We shared the coolest areas in Kyoto, the best times to visit, and asked each of them why they were interested in Japan. And the answers were hilarious! One was taking it purely for credit; another was of Japanese heritage so his parents wanted him to take the course; and, a handful of the students absolutely adore Japanese anime and movies. Thank you for reading this particularly long blog post, and for sticking through it until the end. And thank you very much Professor Suematsu and Kyoto University for allowing me and 5 other MBA students to participate in such an enriching and positive experience. Three cheers to future Silicon Valley trips in 2017! Enjoy Part 1 here, and Part 2 here. Enjoy more interviews with female founders such as Shaherose Charania, Kanoko Oishi, Mariko Fukui, Yuka Fujii, and Kay Deguchi Part 1 and Part 2.